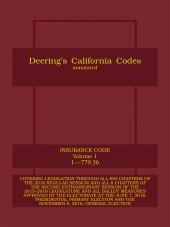 For over 130 years, legal practitioners and business persons have relied on Deering's California Codes Annotated for fast, accurate statutory research. Deering's is a trusted source, with commentary and annotations prepared by California attorneys who understand California law. Now get Deering's Uniform Commercial Codes as two standalone volumes to give you everything you need to know about California Uniform Commercial Code. 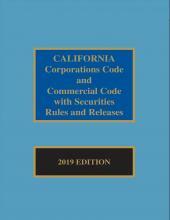 For over 130 years, legal practitioners and business persons have relied on Deering's California Codes Annotated for fast, accurate statutory research. Deering's is a trusted source, with commentary and annotations prepared by California attorneys who understand California law. 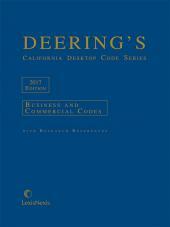 Now get Deering's Uniform Commercial Codes as two standalone volumes to give you everything you need to know about California Uniform Commercial Code. Supplemented Annually This completely up-to-date Uniform Commercial Code includes all significant revisions to Division 9's secured transactions, sales of accounts, contract rights and chattel paper. You'll also find important topics such as sales and negotiable instruments, bank deposits and collections, letters of credit, bulk sales, investment securities, and personal property leases.